Saint City Rotary celebrates small business week each year by inviting a representative of St. Albert and District Chamber of Commerce to speak at our meeting that week. Today we were delighted to have Jodie McFadzen, Volunteer Chair of the Chamber as our program. 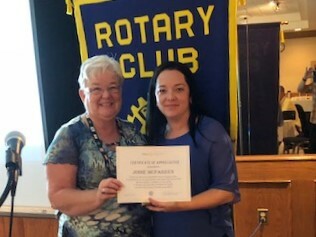 Shown thanking Jodie is club secretary Linda Perras (left).